…that all I really want to do is read. When can I get back to my book? Every day I confront my To-Do List. It’s long and hairy and ugly as, I’m certain, is your own. Rather than taking satisfaction in my daily accomplishments, however, I simply see each tedious, time-consuming task on it as the archenemy of my One True Love. I’ll bet you do. Bloggers are Readers. We travel in packs. I’d like to pretend that my obsession with reading comes from an intellectually curious place deep within me, but that is not true. It actually comes from sheer laziness. Reading requires no moving. Zero. How many things can you say that about? I can sit on my bed as slovenly and sloppy and beached-whaley as I want to, a cup of cocoa warming on the nightstand, and with no physical effort or illegal substances, I’m off to La-La Land within minutes. Think of it. Reading also requires no cleaning, cooking, driving, or getting off one’s tush in general. Reading requires no learned skill (unless you count literacy as a learned skill, but I hope we’re past that by now.) It requires no hand-eye coordination, no great taste or sense of style, no social skills, no money, and no inherent talents. Nothing about reading is about impressing others, unless you’re one of those pretentious sorries who crams your bookshelf with haughty, half-read literature to help you look like an intellectual. (If such is the case, you’re surely not wasting time on this blog.) In fact, the best thing about reading is that you get to pick whatever you want to read. Every time. No one can make you read anything you don’t want to. You are in complete control. How many things can you say that about? I can say it about exactly one. I do love to read. But as long as we’re being honest, I have to confess that I don’t do it as much or as often as this swoony post may suggest. I am a busy wife and mother, and I make way too much love to my To-Do list every day. I am also a rather slow reader, and don’t fly through books like some of my friends do. But I’m always reading something, and I’m usually just in love with whatever I’m reading. (I have no problem quitting a book if I don’t love it.) And I do think that one of the reasons I’m slow, besides just not being terribly bright, is that I make friends with the characters in the book and settle in as I get to know them. I savor my time with each one and remember our conversations long after they’re gone. Painfully nerdy, I know. But true. The problem is: Life keeps finding other things for me to do besides read. When do you read? What do you read? What are you reading right now? I’m almost done with a book called These Is My Words, and it is fabfabfabulous. It’s fabulousness inspired this post. Tell me. And I want to know if your life is full of the same hardships that mine is. Why aren’t we entitled to sit in bed all day and read? Who came up with any alternative plan to that? I need to break my leg or something. Laid-up for six weeks with the Relief Society watching my kids and bringing me dinner? Sounds like a great way to finally, finally get back to my book. 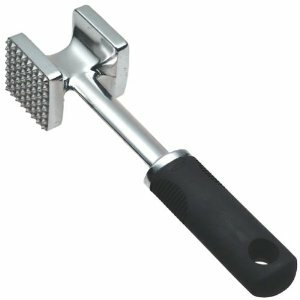 I have been wanting and needing a meat tenderizer for about a decade. No kidding. Every time I had to flatten a chicken breast by pummeling it with my rolling pin, I’d sigh and think, “If only I had a meat tenderizer.” I’d then take my frustration out on the hapless breast. Why, you may ask, did I not simply purchase one a long time ago? a) I kept forgetting, until I was mid-pummel. c) Somewhere down deep, I think I clung to the notion that meat tenderizers were reserved for the deluxe kitchen. I don’t know why. But don’t they seem fancy? And so, the coveted Meat Tenderizer became both an object of desire and a symbol of deprivation. If we think that we can’t have something long enough, that idea settles into our psyche, and we get very comfortable not having it. We become afraid to obtain it and, subconsciously, keep it out of reach. Kind of a too-good-to-be-true mentality, you might say. So it was with me and this dreamy gadget; meat tenderizers were always for other moms. Until today. And so, more than the Tenderizer, this post is really about Making Dreams Come True. What have you been dreaming about for years that would take just a little audacity, a little sass, a little moxy, dare we call it, to make a reality? Next on my list is a waffle iron. Don’t ask me why we’ve never had one. We just haven’t. But I smell Spring in the air, and with it, a time for change. For $29.99, the mother of all breakfast appliances could be mine. It’s gonna happen, my three faithfuls. I can feel it. And when it does, you’re all invited over for waffle/flattened chicken breast sandwiches. If the stars align, there might even be a flour sifter and candy thermometer in my cupboards by then. But we’ll see. One dream at a time.